Dimensions 0.75 by 8.75 by 11 in. Cultural pluralism; United States; History. 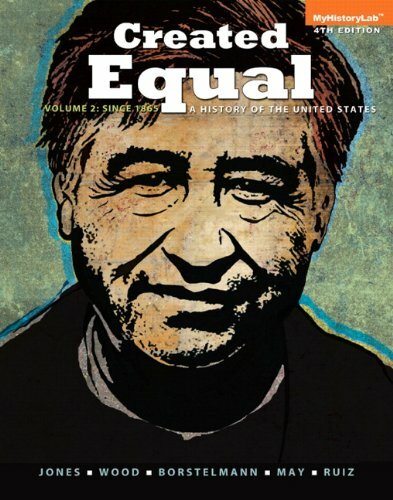 Taking an inclusive view of American history, Created Equal emphasizes the struggles for equality experienced by diverse groups of Americans across the many regions of the nation.Â With a steadfast chronological framework, and a strong narrative thread, the authors offer a fresh and critical perspective on the traditional story. Personalize Learning â Personalize Learning â MyHistoryLab is an online homework, tutorial, and assessment program. It helps students prepare for class and instructor gauge individual and class performance. Emphasize Outcomes â Learning Objective Questions at the beginning of each chapter and a chapter review and thematic timeline ending each chapter keep students focused on what they need to know.Â On MyHistoryLab, practice tests help students achieve these objectives by measuring progress and creating personalized study plans. Engage Students â A new pedagogically-driven design highlights a clear learning path through the material and offers a visually stunning learning experience in print or on a screen. With the Pearson eText, students can transition directly to MyHistoryLab resources such as primary source documents, videos, and mapping exercises. Support Instructors â MyHistoryLab, Instructorâs eText, MyHistoryLab Instructorâs Guide, Class Preparation Tool, Instructorâs Manual, MyTest, and PowerPoints are available. www.myhistorylab.com or you can purchase a valuepack of the text + MyHistoryLab (at no additional cost). About: Re-examines American History through the theme of contested equality Taking an inclusive view of American history, Created Equal emphasizes the struggles for equality experienced by diverse groups of Americans across the many regions of the nation. About: NOTE: Before purchasing, check with your instructor to ensure you select the correct ISBN.